Just something to think about, I guess. To be honest, I don't necessarily agree with Kleon that the work doesn't speak for itself. Maybe not always, but it can and it mostly should. I guess the closest thing I could relate it to is photography. Of course a photograph doesn't tell an entire story, the situation/emotion behind the shot, or whatever else. These things can be really irrelevant though. Sometimes I think that can be part of the work too: others projections onto the work. But anyway, here's a picture taken by me. The "story" behind it that one wouldn't get by looking at it is that it was on a pretty life-changing train ride. 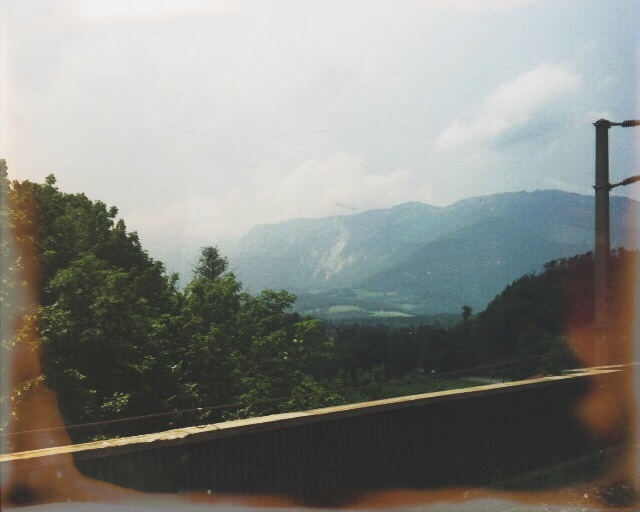 It's somewhere between Austria and Slovenia and was one of the best moments of my life. However, I don't think this information is particularly important to the photo. Hey Abby -- I totally get what you're saying about the ways that some work does speak for itself, especially photography. I think your post and your photo illustrate that although some pieces of art do speak for themselves (in a purely artistic way, like people can appreciate the beauty of your photo), they are often made a lot more interesting when we know the story behind them. Your photo might have caught my eye initially, but once you said it was taken "on a pretty life-changing train ride," I immediately was more interested. Thanks for sharing! I agree that sometimes work speaks for itself and sometimes it doesn't. I've taken pictures that people say "tell a story," but I don't always know what that story is when I take it. My English teacher in high school would use the term "Nancy in a yellow dress" as a literary term. When she first said it, she was referring to something that sounded pleasant, but the character didn't find it pleasant. Someone said, "What's so bad about Nancy in a yellow dress?" and my teacher said, "Nancy was a mean girl in my kindergarten class and she always wore the ugliest yellow dress!" So this term means that something that sounds good to you might bring back bad memories for someone else.